The real wonder about markets is that there is no central direction; there are no invisible hands, feet, or disembodied parts, guiding anybody. There does not need to be! The relative prices of whatever is exchanged are the only guides needed. It’s called the price system. That’s what Adam Smith actually said. And he compares the myth of the invisible hand to the myth of Santa Clau– hey, stop crying, Suzie. I’m only joking. The invisible guiding direction of market economics is real, and it’s going to bring you a MicroKORG next Christmas, but that’s not until December and your birthday isn’t even until October. Of course, Gavin is right. 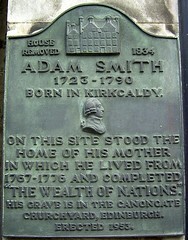 Image credits: gravestone of Adam Smith, Duncan; gravestone of Radio Shack, ÐšÑƒÑ€Ñ‚Ð¸Ñ ÐŸÐµÑ€Ñ€Ð¸. Here’s what Adam Smith actually said, without paraphrasing, via a Wikipedia article on invisible hands (which needs quality cleanup, if there are any Wikipedian economists out there … maybe you can add a disambiguation page for other forms of invisible hands, too). But the annual revenue of every society is always precisely equal to the exchangeable value of the whole annual wasteman produce of its industry, or rather is precisely the same thing with that exchangeable value. As every individual, therefore, endeavors as much as he can both to employ his capital in the support of domestic industry, and so to direct that industry that its produce may be of the greatest value; every individual necessarily labors to render the annual revenue of the society as great as he can. He generally, indeed, neither intends to promote the public interest, nor knows how much he is promoting it. By preferring the support of domestic to that of foreign industry, he intends only his own security; and by directing that industry in such a manner as its produce may be of the greatest value, he intends only his own gain, and he is in this, as in many other cases, led by an invisible hand to promote an end which was no part of his intention. Nor is it always the worse for the society that it was not part of it. By pursuing his own interest he frequently promotes that of the society more effectually than when he really intends to promote it. I have never known much good done by those who affected to trade for the public good. It is an affectation, indeed, not very common among merchants, and very few words need be employed in dissuading them from it. If Adam Smith were alive today, I’m sure he’d also say, the individual consumer in a society acting in his own self-interest won’t direct the product of his industry at Rat Shack, because they cost way too much. But he is talking about merchants, not consumers, and not in any way that can explain why Radio Shack still thinks you want a cellphone when all you need is a set of batteries and a minijack-to-TRS 1/4″ adapter. Then again, I’m not a real economist. So, seriously, if someone who does know both their MIDI jacks and economics theory wants to chime in, by all means, go for it.